If you’re looking to take your daily operations to the next level, you may want to consider John Deere Gator attachments for property maintenance. With a series of attachments, you can make your Gator more versatile and efficient on the job. In this post, we’ll take a look at some of the John Deere Gator commercial property maintenance attachments you can consider for your equipment. 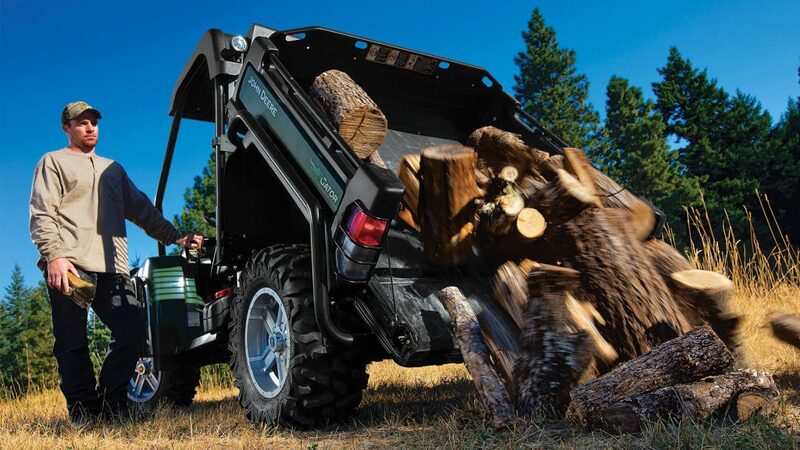 With the Power Lift Kit, operators have one less thing to worry about – it allows the Gator to raise and lower the cargo box as necessary, no manual labor needed. The tool rack allows operators to maximize the use of their cargo box. It holds long-handled tools, such as shovels and racks, outside of the box itself. Out of the John Deere Gator attachments for property maintenance, this one may be the most useful for operators who want to easily transport, mulch, plants, and other debris on the job. Dividers can be positioned at the front or rear of cargo boxes to create separate sections. Along with walls, dividers give the box itself more versatility, as operators can transport multiple types of materials with them in place. The front hood rack easily mounts to the front brush guard. When in place, it can be easily tilted forward to allow full access to the hood for servicing. The rack itself can handle up to a 100-pound payload. There are a number of hitches available for Gators, including a Front Receiver Hitch, welded from strong steel and a rear hitch, which acts as a mounting point for tow-behind attachments. One of the John Deere Gator Attachments (Property Maintenance) you may want to consider is the utility cart. It can carry full loads up to 30 miles per hour on all terrain. It also allows for easy dumping, and a positive lock prevents accidental unlocking while working. There are several winches available for Gators, including the Warn Winch, Winch Bumper Mount Kit, and Warn ProAdvantage Winch. With these attachments, operators can maximize their Gator’s pulling capacity for more versatility. The sprayers for John Deere Gators come in a wide range of sizes, including 25, 45 and 90 gallons. They can be used with weed killer, liquid fertilizer, tree spray, and de-icer. Owners who want more protection on the go may want to consider a soft cab, which easily fits over the roll cage. There are also poly cab options for operators who want four-season weather protection. If you have any questions about John Deere Gator attachments, contact your local John Deere dealer.